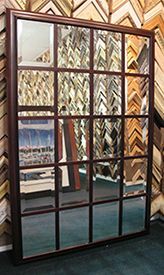 Browse hundreds of style and color options to select a leaning mirror just right for your decor. 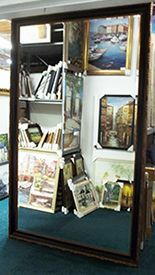 Start shopping for a standing floor mirror with our Value Priced Leaning Mirror Selection. Remember we can make floor standing mirrors in any size. Select the full length mirror of your choice from any style starting with the letters MR. If you want the mirror to stand on the floor, be sure to indicate you would like a leaning mirror in the comments section at checkout. We will attach special safety hardware to protect the leaning mirror from sliding on slick wood, tile or terrazzo floors. What makes a mirror a Leaning Mirror? 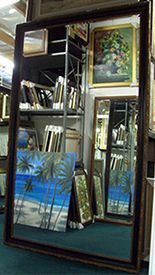 The difference between a leaning mirror and a traditional wall mirror is the way in which it is displayed. custom wall mirrors. Leaning mirrors are simply floor standing mirrors displayed with a decorative flair. 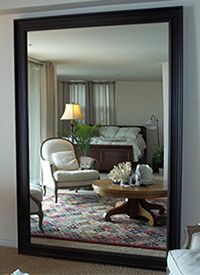 Full length floor mirrors can accent any room - they can be used as a bedroom mirrors, dressing mirrors or room expanders as they make the area in which they are displayed look larger. 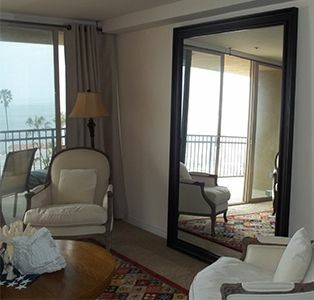 Purchase a leaning mirror or custom wall mirror from any style starting with the letters MR Leaning Mirrors use the same style as our custom wall mirrors. 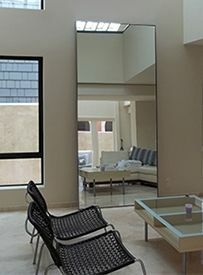 When you purchase a custom floor mirror be sure to indicate in the item comments that the mirror will be used as a leaning mirror. We will provide special leaning mirror safety hardware to help protect the floor mirror from sliding. 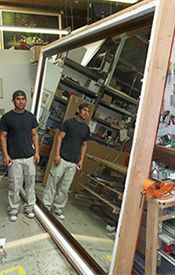 Our leaning mirrors are fabricated in the USA and packed to arrive safely. We guarantee absolute safe delivery on every mirror we make. For smaller mirrors we use FedEx and UPS. 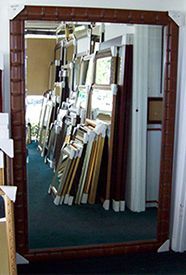 Larger mirrors are shipped with professional National Freight Carriers who deliver directly to your curb. 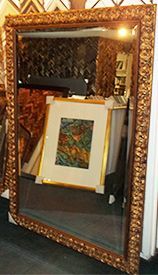 In which case the Shipper will transport the Leaning Mirror into the room or your choice at your business or residence. They will also remove the packing and shipping material. (Note: They will only deliver the mirror. They do not provide additional services such as moving furniture to make room for the mirror- or attach any hardware to the wall). There is an additional fee for the white glover delivery of our leaning mirrors – contact us for details.